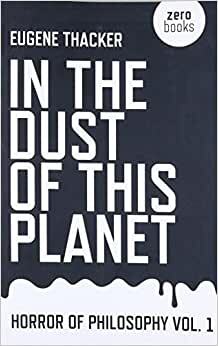 Start reading In the Dust of This Planet: Horror of Philosophy vol. 1 on your Kindle in under a minute. Glenn Beck (ex-Fox News) has done a segment on his show unpicking the "pop-nihilist" conspiracy from the book; posted on youtube.com/watch?v=2IW8OK4_1gQ--Glenn Beck "September 2014 "
Nonfiction horror is not to be found in the known terrors of the past or in the unknown fears of the future but in the unknowable nature of human existence itself. Here is the basis for a new motif of dark seductive mysticism - the unknowability that is beyond the human capacity to make intelligible to the human perspective. The unknowability is all that is known. How is this known? From here, just the horror of emptiness, silence and stillness. We discover that we are the dust of this planet in which we live by considering existence itself as initially being for our use then existence as independent of us and finally existence as indifferent to us; existence qua existence can carry-on just fine, even better, without the excess dust. The world we create is one banal momentum in the pursuit of surplus excess that becomes the dust of this planet. We travel this path to arrive at the existence-without-us when we realize that existence refuses to reveal itself to us and that it will always retain some hidden features just beyond our reach. In terms of our overall understanding, the only important feature about the nature of existence revealed to us is the permanent unknowability of existence itself. Only the hideousness inscrutability of existence and our place as humans in it is revealed, thus showing that we already are the dust of a planet that can do fine without us. No matter how much we know existence, we will never know it objectively for objectivity does not exist out there in the cosmos for us to discover; knowing requires a knower and the knower is always subjective and relative. The finding of objective manifestation in the cosmos is the illusion brought on by human awareness and the mistaking of awareness for existential agency. This creates a paradoxical state of objective appearances within subjective realities. We project our alienated subjectivity onto existence to create our world and then see it as objective. This existence, this planet, this earth, does not need our subjective projections (our dust) to carry-on. The only absolute that can be said to exist is the permanent unknowability of existence, but even this unknowability is from a deterministically human perspective, which is again subjective. All our subjectivity is local, ephemeral and thus the dust of nullability. But we have little time for this existential angst as we are caught up in the world we made, and we think we know because it is the one of our awareness. It is such a world only so from our perspective - projected from our interpretations. Subjective relative psychology is the truth of our existence. We think this is the existence as it is, but it is only the world as we perceive it and thus cannot know it in any other way. This world of ours is the product of false existential assumptions giving raise to our contrived identities that seek normalcy, consistency and predictability which in turn creates the illusion of knowing and delusion of controlling. This is so because we have a dichotomy between the thinking human and the non-thinking nature of existence-in-itself. We use our thinking to make our projections onto the unthinking existence to make it a world knowable to our way of thinking. This is the human experience of confronting an indifferent non-human existence, one wholly other, alien and hostile. Existence is only known in this sea of unknowability, the apparent self-evident nature of observation and awareness, notwithstanding. This why we are the dust of this planet. 5.0 out of 5 starsGreat read. Very academic. I learned of this book through the radio show, on the media, where they discuss both its contents and how it was appropriated by pop culture. it has been a challenging read for me, the author clearly has an expansive knowledge of the topic and its contributors. It's academic and erudite. But I've enjoyed the challenge. It's wonderful to know that there are people thinking so deeply about this sort of cultural niche. Maybe I've read too many classics or I'm rusty with philosophical topics, but personally I found this book to more in line with media criticism, which makes sense considering the author's education and current position. There are interesting concepts, no doubt, in the book, but I'm unaccustomed to arguments being almost entirely supported by citing pop culture. I also thought the structure of the book was confusing and somewhat rambling. Many times it seemed he'd introduce a concept and after several paragraphs we'd already moved on to something else, as if he was trying to make a point about a new topic which hadn't been fully fleshed out anyways. I should have just read the Cliff Notes and saved myself some time. The book title is appealing, but reading it is a grueling task. I was expecting something similar to Ligotti's, "The Conspiracy Against The Human Race".